What is the first association that comes to your mind when you hear (in this case read) the word collocation "Bug infestation"? Exactly - cockroaches. These teeny-weeny, stomach-turning, Earth attendants are surely one of the most unwanted house guests. The reason is as simple as it can get: cockroaches carry and spread diseases and they look repulsive. Amongst all of the types of insect infestations that you can get in the UK, the cockroach sort is definitely one of the more serious. Once the vermin feels at home, it can become very difficult to show them the door out. To win the battle against the pest, of course, with grace and poise, it will take a lot more than just running around the house, spraying with a store-bought bug repellent. In order to approach the situation correctly and efficiently, you need to be properly informed about cockroaches. Aspects like anatomy, eating and breeding habits can help you face the challenge without blinking an eye. How To Identify a Cockroach Problem? While they don't tend to take walks during the daytime, there are other indicators of their presence. If you detect an obtrusive almond scent, dead worm-like egg sacks, transparent larva, smeared dark marks, shed skin or droppings, then congratulations - you are the proud owner of cockroaches. Why Are Cockroaches Such a Successful Pest in The UK? Ok, so you can find different species of roaches all over the world. But how come the infestations rates are so high in the UK? The reason is simple: The prevalence of cockroaches in the UK is just higher. In 2015 more than 1,000 cases of cockroach infestation were found in Southwark, London. The reason is that any heavily populated city centre, with a lot of communal blocks, is more prone to have this type of pest. Why? Because when the bug gets into one of the building's apartments, there is nothing stopping it from expanding its colony to the next one and so on, and so on. Some species show resistance to chemical pesticides. The pest finds shelter in human inhabited places but can be most commonly spotted at properties where big amounts of food can be found, such as restaurants, food processing facilities, hotels, and institutional establishments such as nursing homes. Basically, if you have a lot of food, and are not careful enough with its preservation, you can get a fair amount of roaches. You have a better chance of succeeding in your roach hunt ventures during the night. They are especially known for being nocturnal in nature. Equip yourself with a flashlight, thin, flexible blade so you can poke around in potential bug residences and a mirror for checking under furniture. Remember: cockroaches like tight places. Ok, so your property clean as a laboratory, all food is safely stored, you filled every nook and cranny, but roaches are still tormenting you? It’s time to stop playing nice and show the creatures whos boss. Your preferred method of reclaiming your home should be health- and environmentally-safe. This method helps if you only noticed 1-2 bugs strolling around your living space. In fact, this is one of the ways that professionals use to determine the level of infestation at a person's home. If you have a major infestation, however, it won't fully take care of the problem at hand. Why, you may ask? Because cockroaches make sure to hide their eggs away from human sight, meaning that new roaches will continue to emerge. A bit on the expensive side, but one of the most effective ways of roach control, bait stations can resolve your problem for good. A disadvantage is that they can be harmful to pets and children, so make sure they are out of their reach. Another minus is that the method can actually backfire. The station may become the perfect harborage for the vermin. There is just one word for this tactic - Useless. As highly advertised as they are, cockroach killer insecticidal sprays don't do any work. Yes, they can kill 1-2 bugs, but that's it. As far as you know, millions of roaches and their eggs could be hiding in your walls, and a spray bottle won't scare them, let alone kill them. Sturr up all the ingredients and apply the mixture to the areas with roach activity: under sinks and ranges, behind refrigerators, in cabinets and closets. Replace the solution with a new one from time to time. The bugs will march through it, ingest it, and die. Simple as that. The concoction will help you to manage the levels of an infestation but remember to keep your children and pets away from the powder. At the end of the day, pleasurable is the last word that comes to mind, when dealing with this type of vermin. To install baits and traps can be tricky, most repellents smell disgusting, roaches are repelling, especially when you have to go face to face with them. The list goes on. The best thing that you can do for yourself and your home is to hire a professional pest control technician to take care of the problem quickly once and for all. They will inspect your property and put special cockroach bait, a gel that works in a very interesting way: it's formulated so that it attracts the roaches, deceiving them that the gel is food. They digest the poison, return to their nest and die. And because cockroaches are fond of eating dead cockroaches, others will get poisoned and die as well. Basically, it's something like a Trojan horse. It works with other types of insect infestations, as well. What Are Cockroaches Resistant To? These bugs are mutants, literally. They can develop immunity to certain types of poisonous substances and for hydramethylnon and fipronil, they've already done that. That’s why your ordinary store-bought spray won't do much against them. The bugs are smart, too. They cultivate behavioural resistance as well. Some insects are successful at detecting a cockroach repellent and could start avoiding it. A way to handle situations like these is the IPM (Integrated Pest Management) strategy which is used by professional exterminators. Insects cannot become resistant to sanitation, habitat modification, and physical techniques such as vacuuming and trapping all used at once. To make certain you don't get yourself some unwelcome crawling visitors, you need to take simple but effective precautions. Even just making sure to close your doors and windows can make a huge difference. Like with any other living thing on this planet, water is a vital part of the bugs diet. 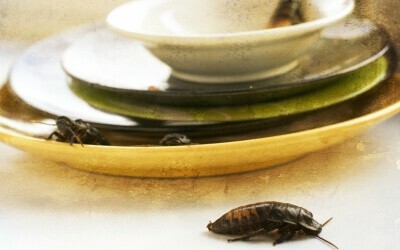 Similarly to their other pest friend, the rodent, roaches can survive between one and two weeks without any water. Still, they will go looking for some when thirsty. Eliminate any possible way to free H2O at your property. Another point to make here is that moist and damp areas are the ones the bugs prefer to make a home out of. At the moment the insect takes a whiff (smell is their way to find food) of any cereal or pet food, not properly stored, guess what happens? A bug feast. To make sure that you ruin the cockroaches dinner plans, what you can, put in airtight containers. Any food left just sitting on the table, kitchen counter, desk, etc. is a big no-no. Without any doubts, you will find yourself facing a marching army of cockroaches. If you have any suspicions of the species running around your property, check your trash bin. It's their equivalent of an all-you-can-eat buffet so you probably will find quite the number of crunchy fellows in there. To prevent that, don't forget to take out the trash regularly and keep your bins clean. Make sure that you keep your home as clean as possible. Take care of any waste or spillage, especially in the kitchen. Ensure to clean off any found debris. The bugs are more active during the nighttime, so don't leave pet food, drink or litter lying around. If you take the extra mile it will help with prevention of infestations. As we discussed earlier, cockroaches are attracted to damp areas so they can be found crawling around pipes and drains. Regularly check these areas and fix any damages, so there is no excess water that can draw the evil-doers to your property. This type of vermin likes to inhabit tight and cosy spaces like cracks and holes. If you spot any of the described in the walls, wooden surfaces and around electrical sockets, we advise you to seal them or to get a professional to do that for you. Doing this will lower the chances of the new "tenants" moving in. As you can see, dealing with cockroaches is a very unpleasant and time-consuming process. Even if you raid the internet for information and methods on how to deal with the situation, there is always a massive chance for failure, no matter what you try and how hard you try it. We highly advise you to reach out to a professional pest control service, so they can handle the problem quickly and efficiently as possible. With cockroach infestations, you have to act as fast as you can because the rate that they breed in is shocking. Want to leave the task to professionals?